OK you're really not cooking snow crab legs, all frozen snow crab comes already cooked. They cook them after they catch them. So what you are really doing is heating the snow crab. Opinions will differ on the best method of heating, so I'll look at all the methods for getting your snow crab hot and let you choose the best method that suits you. A tendency for snow crab is to have excessive water in them. I personally don't like water dripping down my hand or mouth as I eat snow crab. So my preferred method for cooking snow crab is to use the oven, the grill or broil them. These methods help reduce the excessive water. It is best to thaw your crab before you cook them. 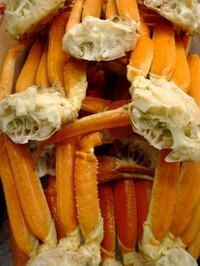 Place your frozen snow crab in the refrigerator the day before you are planning on cooking them. If time doesn't allow for an overnight thaw, you can thaw your crab under cold running water. To see if they are thawed, squeeze the biggest section of the leg. With the thawed legs covered you'll steam these around 6 to 8 minutes. Boiling lets you add spices and seasonings to the water to give your legs some extra flavor. Bring a pan of water to a boil, place snow crab in pan and reduce heat to a simmer. Simmer for 6 to 8 minutes. Well not really baking, but using the oven as a means to heat. I find this method easy because you can do a large amount at a time. Make a double sheet of aluminum foil, wrap your crab legs in and roll the top up leaving a little hole for steam to get out. Bake the frozen snow crab at 450 for approximately 14 to 16 minutes. Thawed clusters can be baked at 450 degrees for about 8 to 10 minutes. Large amounts of clusters will take longer to heat throughly. Wrap the thawed legs in a damp paper towel and cook on high for about 2 to 3 minutes. Times will vary depending on the microwave you have. Just like baking, enclose your thawed crab legs in a foil wrap or packet but this time leave it sealed. Place about 4 to 6 inches away from your heat; you want your heat to be about medium-high, cook for 14 to 16 minutes. With grilling you have less control over a exact heat so you might have to leave them on longer. Place the legs on a cookie sheet. Place the cooking sheet 7 to 8 inches away from the broiling element. Broil for approximately 6 to 8 minutes. Always remember cooking times can vary for many different reasons. Some common sense will help in cooking your snow crab.